To transfer a call or consult a co-worker you do not press the Hold button. The Hold button has a different purpose (more about this later). Instead you either press the Consult button or the Transfer button. You choose the button according to whether you want to speak to the other person (Consult) or not (Transfer). You are then presented with a screen like the Make Call screen, but with the word Consult or Transfer at the top. Your call is not on hold at this stage yet. When you are ready, type the number to dial and click the Transfer/Consult button according to the required action. If you are consulting then the original call will be put on hold pending transfer (the pending transfer bit is important). If you are transferring then the call will be put straight through (remember to say goodbye first). When consulting and you have finished talking to the other caller, you can either click Cancel to return to the original call or click Complete to transfer the original call to your co-worker. 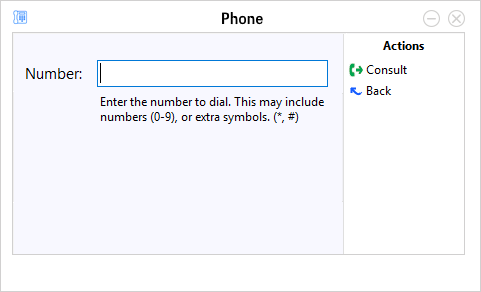 You can also transfer calls by using the Presence window.